On October 29, a Tyson truck pulled up to the San Francisco Food Bank with 35,000 pounds of chicken, thanks to the Hunger Challenge! Hunger Challenge bloggers Amy Sherman (Cooking with Amy) and Faith Kramer (Blog Appetit) were interviewed by two TV news stations, along with Ed Nicholson of Tyson and Paul Ash of SF Food Bank. This was SF Food Bank's share of the 200,000 pounds Tyson donated to six Bay Area Food Banks. Read all about it here - and check out the slide show to the left. The Hunger Challenge is a chance to try and walk a mile in someone else's shoes, to see what the experience of eating on a limited budget is all about. In this case that means spending no more than $1 per meal, per person. Succeed or fail, I know I will learn a lot from this experience and the recipes I develop will go to the San Francisco Food Bank as a resource for their clients. My goal is to come up with recipes that are easy, delicious, nutritious and fit the budget. If they are quick to prepare, so much the better. Frozen organic green peas seemed like a bargain. But what could I do with them? 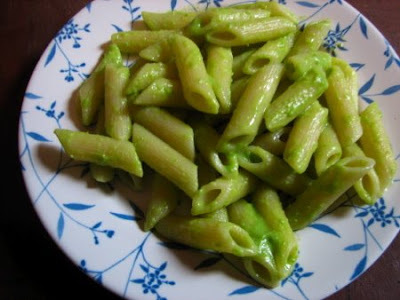 I had hoped to come up with a kind of sandwich filling but ended up with a creamy sauce for pasta. It's actually pretty tasty and is perfect for those times when the cupboard is bare, because it uses mostly pantry staples. Surprisingly this ended up being my easiest, fastest and cheapest meal, and one I know I will make again. Roughly chop the garlic. In a small saucepan combine the garlic and green peas with just enough water to cover. Bring to a boil over medium heat then lower the heat to simmer and cover the pan. Cook for 3 minutes or until peas are cooked through and garlic is no longer raw. Drain the peas, reserving the water. Place the peas and olive oil in the blender and blend, adding just enough water to make a smooth paste, about 1 tablespoon. Combine mixture with parmesan cheese. Serve 2 tablespoons of sauce over each serving of penne pasta. “I’m hungry.”When one of my kids whines that he needs to eat, maybe I grumble about having to deal with it, but I can turn to my stocked fridge, overflowing fruit bowl, full extra freezer or packed pantry and get him something to snack on or make him a meal. My only thought is what to serve and if it will spoil his dinner.When a family is on food stamps it’s just not that easy. Very often the cupboard may be bare; whatever food is available needs to portioned out to make it through the month and to be honest, you hope there’s enough for dinner. And based on my experience this week, I bet there aren’t a whole lot of snacks, treats or even fruit in the house when all you can count on for food is $21 a person a week in food stamps. And portions will be smaller than you are probably used to. Prepare the pinto beans. Set aside.In a large pot, add the oil and heat over medium high heat. Sauté the beef, using spoon or spatula to break up any clumps. Cook until browned but not cooked through. (Work in batches if all the meat doesn't fit or if it doesn't seem to be browning. If the pan is too crowded the meat will steam rather than brown.) Remove to a plate or bowl and set aside. Pour all but 2 tablespoons of drippings out of pan. Heat on medium high, when a bit of onion sizzles immediately on contact with the oil, add the chopped onions and cook, stirring frequently, until the onion are beginning to turn golden brown. Add the garlic and the jalapenos, cook, stirring often, until the garlic is beginning to turn golden. Add the carrots and celery pieces, cook for a minute or two, stirring often. Add the chili powder and cook, stirring constantly, for a minute. Add diced tomato with juices and 2 cups of water. Mix well. Cover and let come to simmer (not quite boiling). Add meat with any liquids it may have exuded, stir well. Cover and return to simmer. 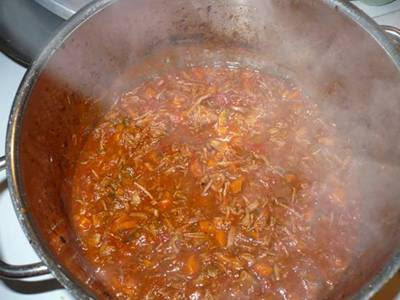 Let simmer for 20-30 minutes until meat is cooked through and flavors well combined. Taste and add salt and pepper to taste and additional chili powder if desired. Add additional water if needed. With cover off, return to simmer and let cook a few more minutes. Sorry about the not nice photo. It might not look it, but this was the best tasting and most filling recipe I’ve made yet for the Hunger Challenge. It didn’t leave me wishing for something else to eat immediately and was super simple to make. I also believe that it has literally the most nutritional bang for the buck of any of my Hunger Challenge creations. You’ve got greens in the form of spinach, protein, minerals and fiber in the beans, and beta-carotene, fiber, and other good things in the sweet potatoes. I thought it would be boring and might need herbs or lemon juice or something but it was really tasty with just salt and pepper. And a tablespoon of oil was the only fat. Doesn’t get much better than that. In a large soup pot over medium heat, warm the oil. Add the onion, celery, and garlic and sauté until soft and fragrant, stirring occasionally (about 10 minutes) Add the beans and water to cover by 2 inches. Bring to a boil, lower heat to a simmer and cover partially. Cook until nearly soft, stirring occasionally and adding water if necessary. 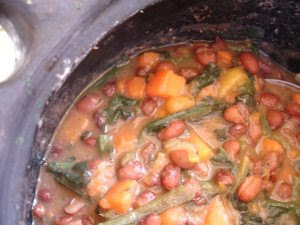 (depending on the age of the beans, this can be anywhere from 45 minutes to 2 hours) Once the beans begin to soften, add salt a little at a time until the beans are salty enough for your taste. Add the sweet potatoes and simmer until tender, about 10 minutes. Add the spinach and cook to thaw and wilt, stirring occasionally. Adjust water quantity, and salt and pepper and serve immediately. I wanted to make a braised dish with the stew meat, and knew it would have to spend several hours in the oven before I’d get to dig in. The fact is, cooking cheap takes more time. You have to use tougher cuts of meat and make things from scratch. It’s like having a second job (and a lot of low-income people already work two jobs). My stew meat, now two days past its sell-by date (the reason I got it at a 30% discount), was a little grey around the edges, so I needed to use it - fast. 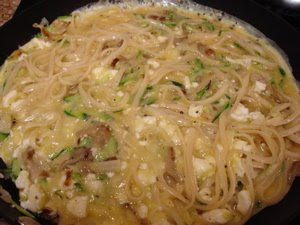 Best case, I would have made this dish ahead of time over the weekend, but my schedule didn’t cooperate. I vaguely followed my favorite Epicurious recipe for Brasato al Barolo – hold the Barolo. Subconsciously, I think I was constructing an "umami bomb," as Jean-Georges Vongerichten is fond of calling it (I'd like to see him cook for $1 a meal!). Mushrooms, tomatoes, browned meat (and the original recipe didn’t even call for mushrooms). Maybe I was trying to make something so savory, my hunger fears would be quelled. Preheat oven to 325 degrees. Dice carrots and onion. Cut mushrooms in half, then slice. Peel and slice garlic. If meat isn’t cut into stew-sized chunks, cut and trim it. Melt bacon grease in a large, oven-safe pot over medium-high heat and brown meat in two batches. Set meat aside in covered bowl. Sauté carrots and onion in remaining fat (add additional bacon grease, if needed to prevent sticking) for 10-12 minutes, until soft and golden brown. Add mushrooms, garlic and herbs; sauté 3-4 more minutes, until mushrooms are softened. Stir in tomato paste and sauté for a minute. Add the diced tomatoes and their juice. Return meat and all its juices to the pot. Add water, stir well and bring to a simmer. Cover pot and place in oven. Cook for 2.5 hours, or until meat is falling apart. Remove from oven and take out and discard stems of herbs. Break up meat with a large fork, pancake turner or potato masher. If sauce is too thin, simmer uncovered on stovetop until it reduces to the consistency of a thick, hearty pasta sauce. Serve over whole-grain pasta or soft polenta. An interesting thing happened when we sat down for dinner. I explained to him about the challenge and how people who don’t have much money don’t have much food or choices when eating. We’ve talked about how lucky we are to have food and clothing and toys and how others are not as lucky. He seemed to understand when we donate clothing, toys and canned goods throughout the year, however this was more real. When he asked for his and his sister’s frozen berries after dinner and I explained in a home where this was all the food for the day I’d have to say “no, I’m sorry, maybe tomorrow” - he understood. The idea on not having enough to eat and going hungry or without himself was a powerful lesson. But I did give him and his sister the berries. No question, I learned what frugal cooking was all about in Italy the land of "la cucina povera." Soups and salads made from stale bread, beans, pasta with nothing but olive oil, garlic and parmesan cheese and the most microscopic portions of meat were all part of my Tuscan diet. But I ate extremely well. I also learned many ways to cook beans. They don't call the Florentines "mangiafagioli" or bean eaters, for nothing. 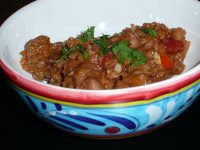 Could this dish be made with heirloom beans from Rancho Gordo and bacon from the Fatted Calf? Absolutely and it would still be a very cheap meal, though not quite $1 per person cheap. Soak the beans in 3 cups of water in a saucepan overnight (or boil for 2 minutes, cover then allow to soak for one hour). Drain the water then add 3 more cups of fresh water. Bring water to a boil then lower heat simmer beans, covered, for 1 1/2 hours or until almost tender and set aside. Chop the bacon, onions and finely mince the garlic. In a large saucepan cook the bacon over medium heat until almost crisp. Add the onions and cook for 5 minutes or until golden. Add the garlic, tomatoes and bouillon. Stir to combine, add the beans, their liquid, adding more water if necessary, and simmer for 30 minutes. Add the macaroni and cook until pasta is done, about 10-15 minutes. Taste and add salt to your taste. Ladle into bowls and top with parmesan cheese. I like to think I have an ancestral way with cabbage due to my Slavic genes. For this recipe I challenged myself to use some of the items the food bank gets a lot of in one dish—namely cabbage, carrot pieces, onions, and cottage cheese. Sounds like a casserole in the making to me! So here we go with Cabbage and Potato Casserole. And it turns out this dish was very comforting and quite tasty, and makes a great lunch the next day if you have leftovers. Only problem: it’s expensive because it needs eggs to bind it and the cottage cheese is expensive when you purchase it at the grocery store. Also I felt that if there was ever a good use for 2 precious slices of bacon, this was it. And, it doesn’t matter where you shop, bacon is expensive! It came out to 84 cents a serving, so it’s under the $1 limit. But really, is that 16 cents going to get you a salad or anything really substantial to accompany this dish? Not really. This is when you just have to go to bed early to forget how hungry and unsatisfied you are. If the potatoes are small, leave them whole, otherwise, cut them into quarters or halves. Bring a medium saucepan of water to a boil. Add a pinch of salt and the potatoes. Simmer the potatoes until tender and remove with a slotted spoon. Add the chopped carrot pieces to the boiling water and cook them until tender. Drain. Meanwhile, in a large skillet over medium heat, sauté the bacon until all the fat is rendered but it has not yet started to brown. Add the onion and sauté until softened, about 5 minutes. Add the cabbage and a pinch of salt and sauté until thoroughly wilted. Add the potato pieces and the carrots, stirring and breaking up the potatoes into smaller pieces with the edge of a spoon. Transfer to an 8 by 8 inch casserole dish. Whisk the cottage cheese into the beaten egg and add salt and pepper. 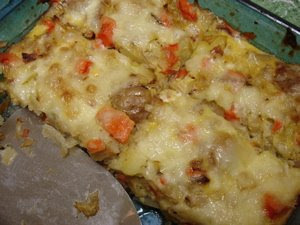 Pour it over the casserole and top with the grated Jack or cheddar cheese. Bake at 350 for 40-45 minutes, or until the eggs are set and the top is beginning to brown. Cool slightly before cutting into portions and serve immediately. Feel free to vary your soup to reflect what you have on hand and your family’s taste. You may want to double the garlic and/or jalapeno if your family likes bolder flavors. Using the seasoned tomatoes and the optional spices will also add some more zip. Heat oil in a large soup pot over medium high heat. Add onions, fry, stirring occasionally until just lightly golden brown. Add the minced pepper and the garlic. Fry, stirring often until garlic is golden. 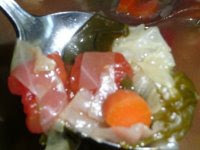 (Add a few tablespoons of water if the vegetables begin to stick or burn.) Add carrots and celery, and continue to fry stirring occasionally for a few minutes. Add the chicken broth and the 8 cups of water. Stir well, being sure to loosen and stir into the mixture any browned bits from the bottom of the pan. Add cabbage, potatoes, tomatoes and spinach. (If using stewed tomatoes, break them into small pieces in the pan with your cooking spoon or spatula.) Mix well, bring mixture to a simmer, lower heat to medium low and cover. Cook, stirring occasionally, until the potatoes have softened but are not falling apart (about 30-40 minutes but the time will vary greatly, so you'll need to keep checking). Add 2-3 cups of water to the pot as needed and return to a simmer. Add salt and pepper to taste and simmer a few more minutes. (Please don’t add the salt before. The broth or the boullion can be salty and the potatoes can really absorb seasonings so you won’t know how much salt you need until towards the end of the cooking.) Can be made ahead and reheated, although the soup may have thickened and you may need to add some more water when reheating. Makes 12 servings, 1½ cups each. Variation: For a thicker, more potage-like soup, puree about half in a blender or food processor in batches once the soup has cooled. This is a recipe I originally made for a friend who was allergic to just about everything. It's an adaptation of a Bon Appetit recipe. She liked it a lot and so it became a regular addition to my repertoire. It tastes a bit like mushroom barley soup and makes a great vegetarian meal with a salad and a glass of wine, but none of those extras fit on the Hunger Challenge budget! Melt Smart Balance in large nonstick pot over low heat. Add onion and cook until translucent, about 5 minutes. Add mushroom and garlic and cook for another 3 minutes. Add barley and toast in the pan for 1-2 minutes, then add water and bouillon; bring mixture to boil. Reduce heat to very low and simmer until most of liquid is absorbed, stirring frequently. 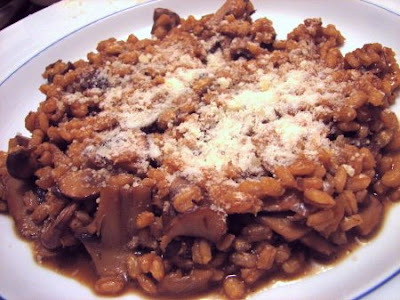 Cook until barley is tender but still "al dente", about 45 minutes adding more water as necessary. 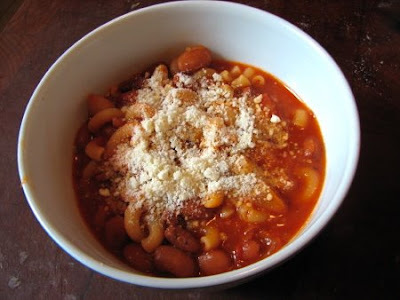 Serve with parmesan cheese sprinkled on top of each serving.Observations:I really enjoyed this meal, so many budget meals are soup or pasta, this was chewy and meaty and satisfying. While the original recipe calls for fresh thyme, it was flavorful without it. A smaller serving would make a nice side dish for a grilled pork chop. I was pleased that it came in right on budget. Dice one-half of one of the onions and slice the remaining onions very thinly. In a medium saucepan with a tight fitting lid, over medium high heat, warm one tablespoon of the olive oil. Add the diced onion and stir while cooking until it begins to brown. Add the lentils and rice, along with 3 cups of water and a healthy pinch of salt. Bring to a boil and lower heat to a simmer. Cover and cook for 15 or 20 minutes. Meanwhile, heat the other tablespoon of olive oil in a skillet over medium-high heat and add the sliced onions and a pinch of salt. Cook, stirring occasionally, until the onions are brown and super caramelized. You truly want them on the verge of burnt. This is what gives the dish flavor. This will take about the same amount of time as the lentils and rice will take to cook. When the rice and lentils are tender, turn off the heat and leave covered for 10 minutes to steam. Serve with the caramelized onions on top. This recipe is part of the San Francisco Food Bank’s Hunger Challenge. It was created for a menu of meals for a family of four costing $21 a person for the week (how much a food stamp recipient would receive.) Ingredients in the stew depended on what sales and values I could find primarily at a local chain supermarket and an independent grocery discount outlet. For about my participation in the Hunger Challenge, my shopping list, other bloggers participating in the challenge and how to support the San Francisco or your local food bank, please click here. I paid $1.99 for fresh, boneless, skinless chicken thighs. If those are not a good value in your area, feel free to substitute other cuts or meats. One tip, check the freezer case. Sometimes frozen chicken and meat can be a much better value than fresh.A word about seasoning. Many dried spices and herbs are relatively expensive, so with the exception of chili powder for my chili (more about that in another post), I made them optional. Use them if you already own them. If you want the punch and flavor of a seasoning, for the best value, skip your supermarket spice aisle and look in the ethnic food section, were there are significant savings. Or buy just a tablespoon or two from stores (such as some Whole Foods) that sell bulk spices and herbs. The spices are usually cheaper to begin with, they are often fresher and since you can buy just the little bit you need, they are much easier on the budget. The discount grocery outlet was a great resource for most common seasonings, having small bottles of spices, herbs and seasoning mixtures for about 50 cents. (I did assume families had salt and pepper, though.) Adding flavor and seasoning helps make the food more enjoyable and add some variety into what is by the very constraints of the food stamp program not a very variable diet. I wanted the food I made on the challenge to not only be filling and nutritious but also as tasty and satifsfying as I could make it.I couldn’t find a way to work fresh parsley, cilantro, basil and/or mint into the weekly food budget, however, and missed the dash of color, texture and taste they add to a dish. I compensated by using fresh onion, garlic and red jalapeno peppers, all relatively inexpensive and big flavor boosters. For example, the peppers cost me 20 cents for 10 of them.In this dish I choose tomatoes that already had Italian seasoning such as basil added to help pump up the taste. You could also use Mexican, traditional (with bell pepper) or plain in the recipe. In a large soup pot, add the oil and heat over medium high. Brown the chicken cubes, working in batches if necessary so they brown, not steam. Stir them so they don’t burn or stick to the pan. When browned but still raw on the inside, remove chicken from pot and set aside on a plate.Add onions to the pot, stir in the onions and fry, stirring frequent until they begin to turn a light golden brown. Add the minced garlic and jalapeno and continue to stir and fry until the garlic as turned a light golden brown. Add the carrots and celery pieces, and continue to fry for a few minutes, stirring often. Add the broth or water, stir well, being sure to scrape up and incorporate any little browned bits stuck to the bottom of the pot and bring to a simmer. Add the optional seasoning, the potato cubes and the chopped cabbage. Stir well. Once the mixture returns to a simmer or very low boil, turn the heat to low and cover the pot. Stir the mixture frequently. 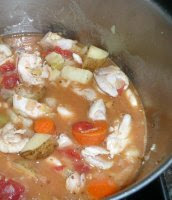 Once the potatoes have begun to soften (about 20-40 minutes), add the stewed tomatoes with their juices. Using your cooking spoon or spatula, break up the stewed tomatoes into smaller pieces. Stir to combine and then add the brown chicken pieces with any liquid they may have released on the plate. Stir well. Cover, return to a simmer, stirring occasionally and making sure the mixture doesn't reach a full boil, until the potatoes and chicken are cooked through. Taste. Add salt and pepper to taste. If the stew has gotten too thick or if you would just like it soupier, add some water, stir well and return to a simmer once more before serving.Makes eight, one-cup servings. Serve over rice, mashed potatoes, polenta or noodles. I was really optimistic that I could make a successful lentil soup on a budget. I was pretty sure it would be tasty and it took very little time to make. It was filling and healthy and comforting. Lee said it was delicious. I used 2 bouillon cubes to try and get flavor into the soup, but what it really needed was spices and a bit of lemon juice. Some aromatics like carrots and celery would have been good too, but I was afraid it would push me over budget. Chop the onions and garlic. Heat a large saucepan and add the Smart Balance. When melted, add the onions and cook stirring for 5 minutes over medium heat. Add the garlic, water, bouillon cube and lentils. 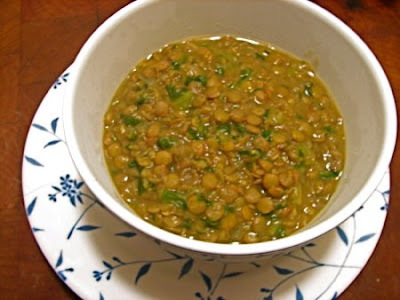 Bring to a boil then reduce and simmer until lentils are tender but not mushy, about 25 minutes. Take the pot off the heat and mash some of the lentils using a potato masher, add more water if necessary and the mustard greens. Heat through and serve. Rude awakening:* I stayed just under budget, but there was no money for salad or a glass of wine, let alone dessert. Here’s the first official recipe for the San Francisco Food Bank Hunger Challenge. I’m trying as much as possible to use the commonly available food bank ingredients listed here at the bottom of the page. 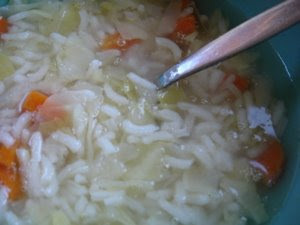 This simple soup is inspired by one of Marcella Hazan’s that includes rice and escarole and little else. I’ve upped the onions and added carrots and used a bouillon cube instead of homemade stock. This recipe comes in at 54 cents per serving, but the servings are small and you’re going to need some bread and perhaps a piece of fruit for dessert so there’s your $1 per person per meal. This really isn’t easy. Though the nutrients are fairly balanced, there’s not enough protein in this meal and a person doing physical labor is likely going to want more to eat than this. In a medium pot, over medium heat, warm the olive oil. Add the onion and sauté until soft and translucent, about 10 minutes. Add the carrots and cabbage along with a pinch of salt and cook, stirring occasionally, until the cabbage is wilted. Add the water and the bouillon cube and stir to dissolve. Bring to a simmer and add the rice. Cover partially, and cook for 15 minutes until the rice is cooked through. Adjust seasonings and serve immediately with a little Parmesan cheese sprinkled on top. This is a good recipe for using leftover odds and ends in your refrigerator. You could use cooked broccoli or any kind of vegetable and any kind of cheese you have. In a nonstick pan, sauté onions and garlic in butter or oil. Add mushrooms and a little salt and pepper. Sauté until beginning to brown. Add zucchini and more salt and pepper. Add pasta Stir and arrange evenly in the pan with the spoon. Sprinkle cheese on top of the spaghetti, distributing it evenly. Pour in eggs with a little more salt and pepper. Lift the spaghetti cake and tilt the pan so the uncooked egg runs underneath. Do this a few times until the egg is mostly set, turn down the heat and cover the pan until the egg is completely cooked. Cut into wedges and serve immediately. As part of my participation in the Hunger Challenge I tried to add variety and convenience into a budget that only allowed for $1 a day per meal per person. I’m told some of the basics San Francisco Food Bank customers often receive are onions, carrots, rice and cabbage. I’ve put them to work in this recipe, however, even if you had to pay for those ingredients, the recipes still cost out at a $1 per serving or less. You can see my shopping list, my other recipes, how this fits into my week’s menu, how to donate to your local food bank, and more by clicking here. First up, make the sauté and rice. Leftover rice and sauté will be used with some other basic ingredients to make the Food Bank Fried Rice. This is family dinner fare with an Asian flare; the techniques and seasonings are simplified to keep costs and prep time down a bit. If you have some Chinese or Japanese chili or sesame oil handy, you could mix in a teaspoon or to taste a minute or so before the sauté finishes cooking. Another nice addition would be a sprinkle of freshly minced cilantro or green onions on top the finished sauté and fried rice dishes. A good add-on to the stir fried veggies would be a chopped red bell pepper. I couldn’t “afford” any of these additions on my Hunger Challenge “budget” however. Even without the extras my 17-year-old son couldn’t believe these dishes were part of the Hunger Challenge because, according to him, they looked and tasted like something I would “normally” serve. Some other suggestions: You could substitute a few packs of the soy sauce that comes with takeout Chinese food (if you have some) and save buying the soy sauce. For the lowest cost soy sauce, look in Asian grocery stores. These grocery stores often have very reasonably priced produce and meats. If you have access to one it might be a way to save a bit on food costs when you shop. Note: Use whatever green vegetable you have on hand. My menu had a half pound of frozen chopped broccoli left so I would use that. I’ve also made it with snap peas and green beans. Use what is cost effective and tasty for you. Heat the oil in a large fry or sauté pan or a wok until a bit of onion sizzles when it is dropped in. Working in batches if necessary so as not to overcrowd the pan, brown the chicken pieces. When browned on all sides, remove from the pan and set aside on a plate. Add in onion and sauté or stir fry until it begins to turn golden brown and soften. Add the garlic, peppers and ginger and fry, stirring often, until garlic begins to color. Add carrots and cook, stirring often for a few minutes until they begin to soften. Add cabbage and cook, stirring, until it begins to soften and wilt. Add the chopped green vegetable, and mix well to combine, stirring often as the mixture cooks. Add in tofu and the browned chicken with any juices the chicken may have exuded. Cook for a minute or two, stirring often so tofu doesn’t stick but picks up a little color. (Add some of the broth or water if you need to prevent the tofu from sticking.) Add chicken broth and the soy sauce, cook, stirring often, until chicken is cooked through and the liquid has cooked down to make a sauce that just covers the bottom of the pan. Taste and add more soy sauce if needed. 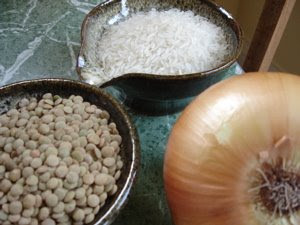 Note: To prep the leftover rice for this recipe, spread it out on plates or in a baking dish so the grains don’t stick together as much as it cools. Once it has cooled to room temperature you can go ahead and make the fried rice or store the rice in a container or storage bag in the refrigerator. Let the chilled rice come to room temperature before using. Heat the oil in a large fry or sauté pan or a wok until a bit of onion sizzles when it is dropped in. Add in onion and sauté or stir fry until it begins to turn golden brown and soften. Add the garlic and peppers and fry, stirring often, until garlic begins to color. Add celery and cook, stirring often for a few minutes until they begin to soften. Break the eggs into a small bowl or cup and beat well. Drizzle the beaten egg slowly into the vegetable mixture, letting the eggs rest about 20 seconds until they just begin to set, then quickly stirring hard and thoroughly until the eggs resemble strands of cooked scrambled eggs mixed throughout. Add leftover sauté and cook, stirring often, until chicken is beginning to warm through. Add a few tablespoons of water if need to prevent the mixture from sticking. 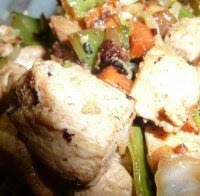 Stir in the rice, breaking up any clumps and incorporating into chicken and vegetables. Stir in the soy sauce, mix well. Heat until dish is heated through. Makes 4 servings about 1 ½ cups each (using 4 cups of leftover rice). Thanks to 2,000 Comments, Tyson Donation Goal is Reached! In less than a week, 2,000 people visited the Tyson Hunger Relief website and made comments. Each of your comments added 100 pounds of high-protein food to Tyson trucks heading for Bay Area food banks. We've hit our goal, and much of the 200,000 pounds of food have already arrived. Thanks to everyone who helped us! The Hunger Challenge Day 4: Don't Chicken Out!